We use energy for everything we do so our approach to alternative sources of energy could have significant effects on the planet. Solar energy, for instance, is the most eco-friendly of all energies, and you can use it for your everyday usage. You will need solar rechargeable batteries, and we’re here to guide you through your options. People across the globe have become more aware of their environmental footprint and the safety of the environment, so they turn to solar energy. There are many different kinds of solar power rechargeable batteries on the market and you have to do your research before you make a purchase. Some of them have exclusive functions, and the price ranges also differ. Powering and maintaining a solar panel (or any kind of solar lights) requires a level of knowledge, and we can help you make a sensible decision regarding the solar rechargeable batteries you need. 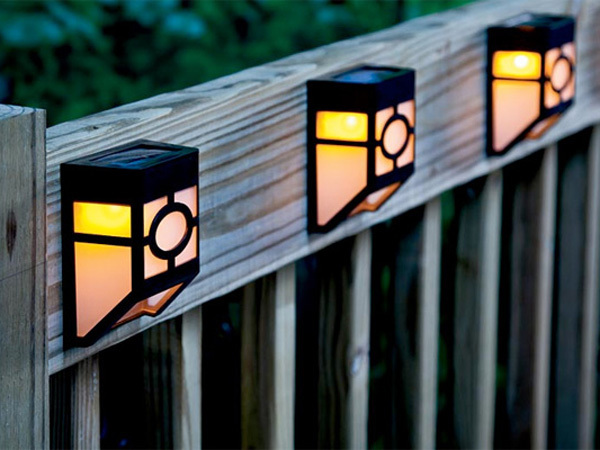 Investing in solar lights can be an easy way to reduce the energy consumption in the home and garden. Usually, online and in-store manufacturers sell them with pre-installed, pre-charged batteries. However, many people fail to realize that these rechargeable batteries will not last forever. They will eventually run their course and when they lose their effective capacity, they need to be replaced. For most brands, solar batteries will last about two years of nightly use. You can almost always replace these solar light batteries, but you have to purchase the correct rechargeable batteries. Both portable and solar lights highly depend on the quality of the batteries you invest in. There are currently four popular types of rechargeable batteries that can be used in solar lighting – Ni-MH, Ni-Cd, lead acid and lithium-ion. This article will guide you through the understanding of the specifications, advantages and disadvantages of these batteries. But first, let us review some of the things you need to consider when it comes to solar rechargeable batteries. If your lights function with NiMH or NiCd rechargeable batteries (more about these below), then you can buy either of the two as replacements. Nevertheless, we suggest you use the NiMH (Nickel Metal Hydride) chemistry. 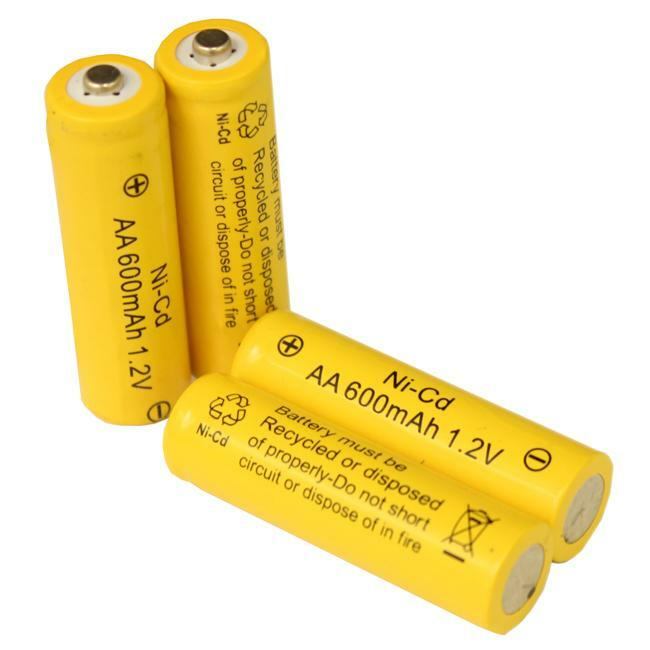 The cadmium in NiCd (Nickel Cadmium) batteries is considered a toxic material, so if you do buy these, you have to recycle them properly. You can throw the NiMH batteries in the trash, but you can also recycle them as well. This specification is listed right on the batteries as mAh (milliAmp hours). Basically, this is the amount of energy the battery can store and supply after a full charge. Some solar lights and panels come with a higher energy demand, so you should equip them with batteries with capacities between 1000 mAh and 1300 mAh. If your solar light needs two or more rechargeable batteries, make sure the batteries have the same capacity. For instance, you shouldn’t use a 300 mAh rechargeable battery in a solar light that had an original mAh rating of 1000 mAh. You can replace the original batteries with higher rated mAh rechargeable ones, but never under the original rating. Voltage is one of the most important aspects when it comes to replacing the NiCd or NiMH batteries. Both of them are typically rated at 1.2 Volts, so using two or more of this series will consequently increase the voltage. Therefore, using two NiMH AA 1000 mAh 1.2 volts will give you a system of 2.4 volts at 1000 mAh capacity. 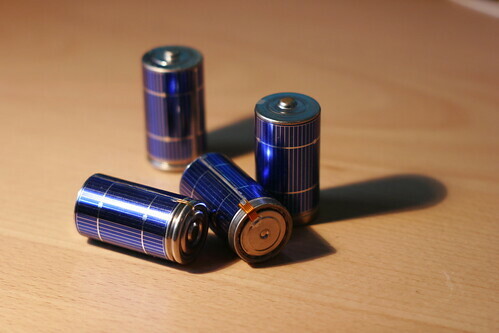 If your solar light needs just one NiMH rechargeable battery, make sure you replace it with one of the same chemistry. Never use a lithium battery, even if it features the same mAh rating; lithium batteries have a higher voltage rating (usually 3.2 for solar lights). So now that you know what’s what, it’s time to explain the pros and cons of each type of solar rechargeable battery. Bickel zinc rechargeable batteries were born out of the need to replace military-grade silver zinc batteries. Nickel zinc batteries provide 1.6 volts, which is more voltage at a higher discharge rate than their lower-voltage counterparts. Thanks to the higher voltage, these batteries can deliver energy faster between the energy source and the object that’s powered by the said battery. Given the non-combustible, non-toxic and recyclable properties of nickel zinc batteries, these are the among the most environmentally-friendly batteries available. Even smaller nickel zinc batteries can power cameras and global positioning satellite units. The Ni-MH (Nickel Metal Hydride) battery is another type of rechargeable, mainly used in portable consumer electronics of smaller sizes. In form and components, the Ni-MH battery is very similar to the Ni-Cd battery. One big difference, however, is that it lacks the toxic cadmium used and replaces it with hydrogen. Also, Ni-MH batteries have become better performing than Ni-Cd batteries, which is why they’re used in a wider range of electrical appliances. Their energy density is twice as high as the Ni-Cd batteries. Lithium-ion batteries have high energy density and triple the voltage of 1.2-volt batteries. It allows these batteries to store more energy than low-voltage batteries. Thanks to the higher voltage, lithium-ion batteries also feature lower discharge rates, meaning they will retain their charge for much longer than any other battery type we know. But the energy efficiency comes with a price, so you’ll pay much more for a lithium-ion battery than the others. One of the downsides, however, is that the varied sizes of lithium-ion batteries sometimes make it difficult to match the charger with the capacity requirements. Last but not least, lead acid batteries are among the oldest types of rechargeable batteries. In spite of their long run, they’re still pretty popular today. Lead acid batteries are often used as starting batteries, and they also power portable flood lights. There are two types of lead acid batteries. Starting batteries, on one hand, are good for automotive engines. Deep cycle batteries, on the other, will serve you well in the long run, and support discharge cycles much better. Deep cycle lead acid batteries are mainly used to power portable flood lighting.